Whether you're a homeowner or a renter, sooner or later, something is going to break. And when that time comes, you'll have two options: fix it yourself, or get someone else to fix it. 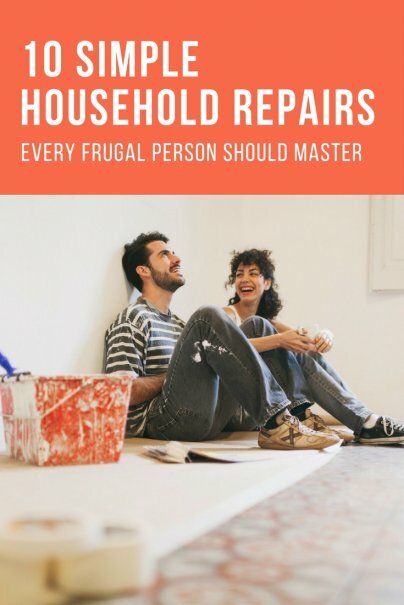 The latter usually costs money — unless you happen to know someone who'll help for free — and yet, so many of these repairs require minimal skill and effort to get the job done. Here are 10 of the easiest household repairs every frugal person should have under their belt. Drip. Drip. Drip. It can be the annoying sound that wakes you up at night, or one that constantly bothers you in the kitchen. You have a leaky faucet. The most likely cause of that leak is a worn washer, and they are very easy to replace. No need to call a plumber, because all you need are a few basic tools and a new washer. Turn off the water supply, remove the faucet cap, unscrew the handle, and unscrew the nut. You'll reveal the valve stem, which you remove, and voila… the old washer is revealed. Replace it, and then do everything in reverse. Here's an instructional video that explains a basic washer change in just a few minutes. You'll save water, and a lot of money on a plumbing charge. It's amazing that some people still hire someone to come and replace the filter on their furnace. This is literally a job that takes less than a minute to do, and anyone can do it. What you need to do is find the correct size of filter, which will be written somewhere on the furnace. When you have the dimensions, you can go to a hardware store for replacements or order online. Don't go for the cheapest type; you want one that traps not just dirt, but allergens and other air hazards. Remove the furnace door — this will almost always deactivate the furnace, but if not, turn it off at the switch. Slide out the dirty filter, and replace it with the new one, making sure to insert it with the arrows pointing in the direction of the airflow. Then, close up the furnace. It's that easy. Some home repair jobs can actually be a lot of fun, and this is one of them. Painting a room, especially a kid's room or playroom, can be creative and fulfilling. But whether it's a bedroom, living room, or kitchen, you'll need some basic tools and a few tips before you start. Get a variety of paintbrushes; you'll need some for small, fiddly areas, others for big areas like doors and walls. You will also need a paint roller and tray, or a paint pad. Plus, dropcloths, painter's tape (Frog is excellent), paint, a stepladder, and some clothes you don't mind getting dirty. Make sure to block off any areas you don't want paint to land on — including the ceiling lines, window trim, door frames, and baseboards. Paint around those areas first, then fill in with your roller or paint pad. You will usually need to do two coats, and maybe more if a light color is going over a dark one. Walk down the Locks and Doors aisle in any hardware store and you'll be greeted with a plethora of different options. You have so many choices here, and it takes very little time to change out a door lock. (However, installing a lock from scratch is a lot more involved). The hardest part of all this is making sure you get the right replacement lock to fit the one you're swapping out. Take a look at it first, remove it, take photos, write down model numbers, etc. Take that information to the hardware store, and they can guide you to the correct one. Then, with just a few screws, and you're good to go. Never let it be said that sewing is a hobby. It's something we should all know how to do, because it can save us a lot of money on clothing and other repairs around the home. From torn curtains and sofa cushions, to holes in jeans and shirts, some basic sewing repair skills are essential. You don't need to be a master tailor, but having a grasp on the basics — such as sewing on a button, darning a sock, or patching jeans — will really help you out in the long run. You don't even need a sewing machine. Just a very simple sewing kit will do, for under $10. You flick the switch, and you hear one of two things: complete silence, or a faint buzz. Either way, it's not the growl of the motor and the blades that you were expecting. When this happens, your garbage disposal is clogged. You may be tempted to call a plumber, who will either fix it for you, or suggest an often unnecessary replacement. But this is a job you can do easily yourself. First, it may have stopped working due to a jam. Unplug it, and reach in there to see if something is stopping the blades. Fish it out, if that's the case. If not, you will still want to go underneath the disposal and turn the blades using the Allen wrench that came with it. After turning it several times, you should feel the blades loosen. Hit the reset button on the base, plug it back in, and hit the main switch. Your disposal should now be working again. So many people I have talked to, including family members, have bought a new screen door when the mesh has ripped or worn out. This is a huge waste of money. If the screen door itself is in great condition, you only need to replace the mesh, and that's a job most people can do in less than 30 minutes. You'll need to buy replacement screen mesh and a screen door spline roller. The pair will cost between $20-$30 depending on the store you buy them at, and the type of screen mesh you opt for. The hardest part is actually removing the screen door from the track. Once that's done, you remove the old rubber cord and mesh, place the new one on the door, roll in the new rubber cord, and trim the excess. It's that simple. Over time, the caulk surrounding bathtubs and sinks will need to be replaced. Sometimes it gets discolored or moldy. Sometimes, it can actually begin to peel away, and start causing issues with leaks or water damage. In that case, you need to replace the caulk. And the good news is, it's really easy. All you need is a caulking gun and caulk, which comes in a wide variety of colors and types. Talk to an expert in your hardware store about your needs. Clear out any of the old caulk, which can be done using a Stanley knife and a scraping tool. Make sure the area to be caulked is clean and dry. Then, apply a thin bead using the caulking gun, and with a wet finger, swipe away the excess to form a beautiful new seal. Squeaky doors, windows, stairs, and floorboards are more an annoyance than anything else, but they don't have to be. They are usually a very simple fix. For squeaking doors and windows, some spray lube, WD-40, or white lithium grease will usually eliminate the problem. If none of those are available, even a little olive oil or Vaseline can work. You are simply looking for a way to reduce the friction. For floorboards, it's a little more involved. Most of the time, it happens because the floorboard has raised up from the main floor joists or the subfloor. In that case, a shim can eliminate that gap, and thus, the squeak. What other home repair should every frugal person learn? Let us know in the comments!